Canada's Bill Wells on his way to victory in The Race 2014. FOR A MAN who cycled, kayaked, rafted and ran his way from Istanbul to Shanghai, not taking part was torture of a static kind. Derry native David Burns sat in a cramped control room, back in February, and kept in touch with events across a 260km course in northwest Donegal. As one of the organisers of The Race, he had volunteered to monitor a slew of mobile phones and walkie talkies, and to keep the St John’s Ambulance up to date on the 60 competitors taking part. Fellow organiser Maghnus Collins was out at one of the course’s check-points but Burns was ‘stuck in a shoebox for 24 hours, surrounded by just as many phones’. 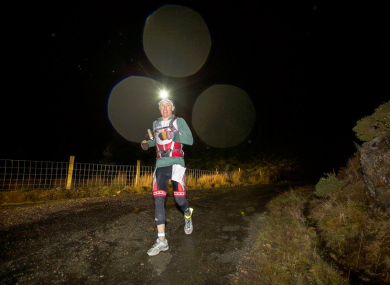 The Race returns for its second year in March 2015 and is undoubtedly Ireland’s toughest endurance event. In the space of 24 hours competitors will be required to complete 15km kayaking, 5km of fell [mountain] running and scrambling, 166km cycling and a marathon and a half. In total 250 km will stand between competitors and the finish line. It is often not about how physically tired but how mentally tired you are. When you give everything on a particular day and, in your head, you’re ready to give in but you keep going — the feeling of pushing through and earning the reward is what were are trying to replicate. We wanted to create a challenge where people are not guaranteed to reach the finish line. There is no place more imposing, stunning and punishing, Burns feels, than northwest Donegal to stage such an endurance event. “Donegal in February and March provides a real challenge. The temperatures often drop below zero at night and the strong winds make it so tough. The other intriguing aspect of The Race is the lack of support crews for competitors. Each person taking part is allowed a 10kg box to store whatever items [clothing, food, torches, etc.] they feel will help get them to the finish line. The boxes are transported to checkpoints while 200 volunteers and medical staff are on hand to monitor and guide those taking part. There is a cut-off time for each discipline and some competitors, earlier this year, were advised to withdraw mid-race as they were physically unable to continue. The Race 2014, staged in aid of Self Help Africa, was won by Canada’s Bill Wells in a time just over 15 hours and 22 minutes. Irishmen Sean McFadden and Michael McCarron finished within 15 minutes of Wells. 35 of the 60 competitors made it to the finish line and Burns says the feedback was exactly as he hoped for. “People were shocked at how hard it was,” Burns revealed. “I was called disgusting and sadistic but many of the people that said that have signed up again. A lot of people have since told us that The Race had a major impact on their lives. When you devote yourself to a challenge like this, it does have a profound effect. He added, “One of the competitors caught up with me after the race and said ‘The best part was stage five. The hail was lashing against my face and I couldn’t see as it was so dark. I knew it was the race for me. Email “'I was called disgusting and sadistic but lots of them are doing it again'”. Feedback on “'I was called disgusting and sadistic but lots of them are doing it again'”.